Workshop with Bernie Rosage Jr. Location: Jean Wenner Studio at the Council for the Arts and at Wilson Bay Park near the Council. 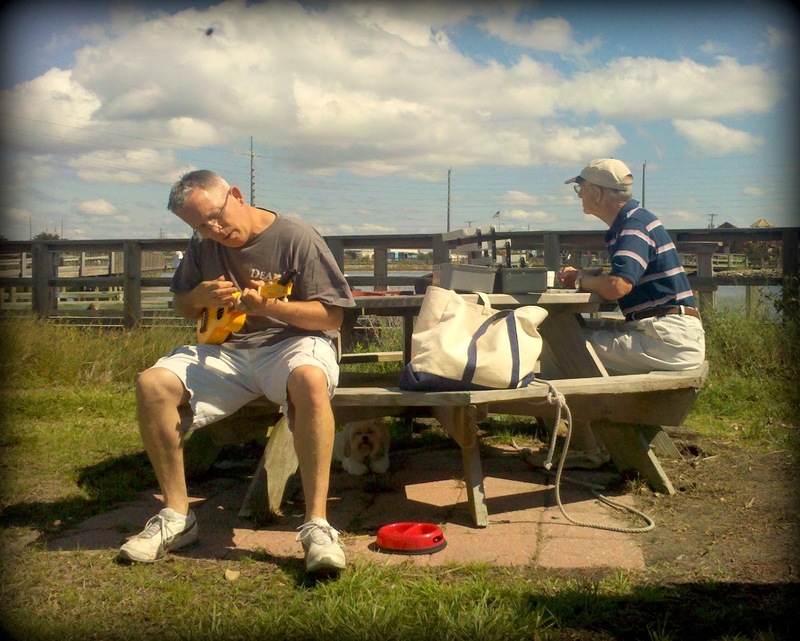 Have you felt a little overwhelmed by the thought of trying to paint en plein air? Bernie shows you how fun the process can be as he breaks it down into a series of manageable steps. Learn what to expect in the field, what to pack, how to work with a limited palette, how to choose your subject matter wisely, simplify it and develop a dynamic design, plus more! This workshop is designed for all levels of artists who have little or no experience in plein air painting. As the founder of the Onslow Outdoor Painters Society (OOPS! 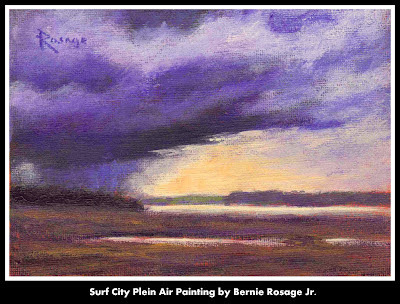 ), Bernie is constantly approached by artists who express an interest in plein air painting but are crippled by the intimidation of it. The goal of this workshop is dispel that fear and unveil the joys and benefits of painting in the open air on location. 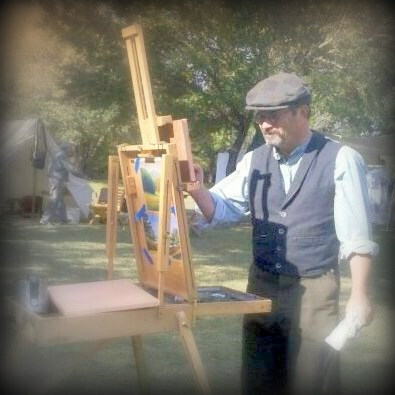 All artists, especially experienced studio artists, will benefit from the plein air experience. Please check your email "inbox" for an email from Bernie concerning the organization of a carpool for our paint out this Sunday at White Lake. Please respond to it asap. CALLING ALL PLEIN AIR PAINTERS! For more information about the juror please visit: mikerooneystudios.blogspot.com. 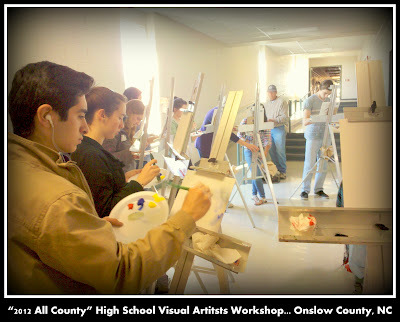 Up to three (3) pieces of work created during the Paint Out may be entered for the juried competition. There is no limit to the number of pieces that can be exhibited and for sale. All work will be exhibited and for sale on Friday evening, May 4th and 10:00am-4:00pm, Saturday, May 5th at the Art Gallery at Mother Earth Brewery on North Street in Kinston. 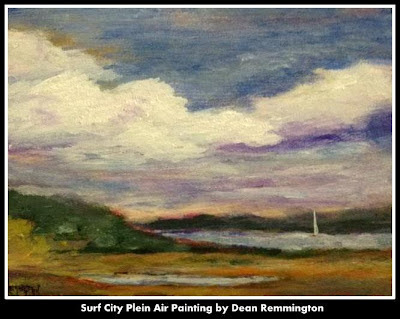 The art will then be moved to the Arts Center, 400 N. Queen Street, Kinston to be on exhibit and sale through August 4, 2012. Please contact the Arts Center for further details (252) 527-2517, Mary Page Whitley (252) 527-7125. WHAT: OOPS! APRIL 2012 Paint Out organized by Kathy Bunn. I would love to invite the OOPS group to White Lake on April 29th. Come paint beautiful White Lake with crystal clear water which is fed by subterranean springs, not to mention the beautiful cypress trees. We’ll meet at my home on 56 Fayetteville Road, White Lake, NC 28337 at noon. 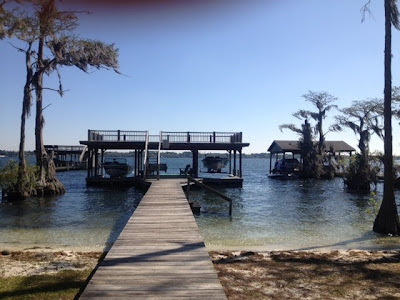 We have a couple of options, we can walk a few yards down to the end of my street and paint on our pier and/or, go to the top deck of the pier for a spectacular view or you could go to Camp Clearwater nearby to paint there. 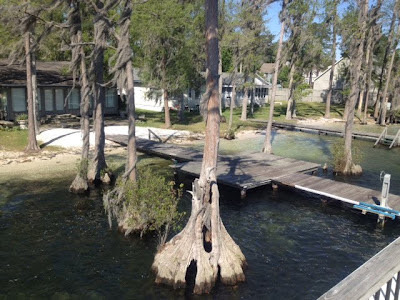 You are all welcome to my home to use the bathroom or take a little break, Camp Clearwater has bathroom facilities on site. The lake season does not begin until the middle of May so it should be fairly quiet. I hope you will join me on Sunday, April 29th. Directions are easy from Jacksonville, just follow Hwy.53 toward Burgaw and continue on Hwy. 53 to White Lake. Turn right on Fayetteville Road, my house is third house on the right. Hope to see you for a fantastic plein air day. My cell is 910876 7132 if you have questions. Looking forward to painting with everyone! 2. Turn left onto E Railroad St.
3. Take the 1st right onto Old Bridge St.
5. Turn slight right onto US-258 W/Richlands Hwy/NC-24-BR W. Continue to follow US-258 W/NC-24-BR W.
8. Take the 2nd left onto N Walker St/US-117-BR/NC-53. 9. Take the 1st right onto E Wilmington St/NC-53. Continue to follow NC-53. 10. Turn right onto Fayetteville Rd. 11. 56 FAYETTEVILLE RD is on the right. WHAT ELSE: We will send out and email the week before the event to organize a car pool to Kathy's house at White Lake. If you participated in this event on March 25th and would like to enter your work in the show please let Ellen know as soon as possible (contact info below) plus how many paintings you will be bringing in. There is no entry fee....just an opportunity to see some great plein air work. Please have your work at ArtExposure no later than Thursday morning, April 12th with Title, Artist, Medium and Price attached to the back. If you do not wish to sell, please write NFS. Please have work properly framed with wire for hanging. ArtExposure retains 35% for all sales (30% for members). The show will remain up until May 8th. who will send directions and details soon! We plan to organize a cool pool for those interested!